Dan Morrill: It is rumored that I fly fished with flies tipped with a worm, until I was 12. In reality, they were 'rock rollers' which are caddis larvae. Of course this was done when dad and grandpa were not looking. I soon started not feeling right about it, so I changed my ways. My passion for fly fishing and the mesmerizing places it takes one, started in 1971 at the age of eight. My father was a school teacher, after retiring from the Navy, and therefore we were able to spend the summers fly fishing in Utah on the Green River, Blacksmith Fork, Logan, Provo and scores of other blue ribbon streams in Wyoming, Montana, and Idaho. 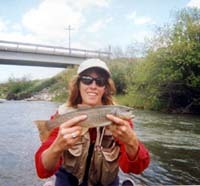 I have been a Montana licensed guide since 1993. 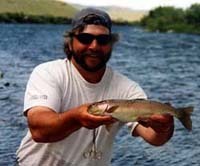 From 1992 I have averaged well over 100 days a year on the legendary Madison River. It is with much pleasure that I am able to share my knowledge of the river and fishing with anglers of all abilities. Eric Tips: Eric Tips has been working in the outdoor recreational field for well over a decade which sometimes I think he is just outstanding in his field... just standing in his field, that is. 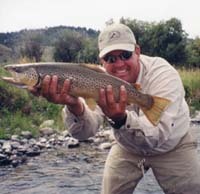 Eric started guiding in the Oklahoma area before moving to Montana in 1994 to follow his passion of spending quality time with people on the Madison. 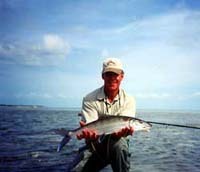 You will be entertained while learning our home waters when fishing with him. He is a favorite partner to work with on our group floats. Matt Morrill: Big brother convinced Matt by age 9 that fishing with bait or hardware leads a soul down one path… straight to the hardware store and the pork rind aisle. I still say he is a reforming worm dunker. Matt has a laid back nature, possesses the patience of Job, yet is quite prone to making you a better angler, while giving you a day to remember. Matt has spent over a hundred days a year on the Madison for the last decade. He is great with beginners and people who want to learn more, without making it feel like a day of instruction. If you are looking for a fly fishing drill sergeant look elsewhere. 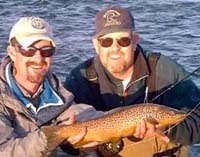 Joe Moore (on the right): Joe Moore started fly fishing at the ripe old age of 7. He spent a couple of years working down on the Missouri River before moving to the Madison. He was the shop manager for Madison River Outfitters before guiding on the river for the last 4 years. He is very adept at getting people into fish, much to the chagrin of the wild trout we all pursue. 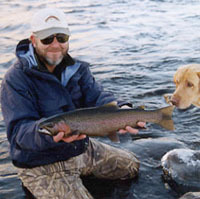 Dan Hull: Dan has been guiding and outfitting since before Bud sold the Trout Shop. Yep, when he flagellates, the dust flies. On the more serious side, he started guiding on the Madison for Bud Lilly before the Bicentennial, and he founded Madison River Outfitters in '81. He calls the Madison, Yellowstone, Missouri, Gallatin, Beaverhead, Big Hole, and the Bitterroot his home water. I have bumped into him on all these waters over the years…. If the fishing is hot, Dan is there. 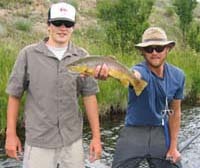 Pat Bond (on the left): Pat is a local outfitter who possesses a hardworking nature, with great fish sense, and a rare breed of humor which makes a day with him on the water one you won't soon forget. He has been harassing the fish on the Madison, Gallatin, Missouri, and Yellowstone Park waters for near a 100 moons now. Pat spends his winters in Florida pursuing salt water game fish on the fly and returns to the headwaters of The Missouri every spring to take his annual bath. Lanie Gospodarek: Lanie is one of the most fastidious guides I know. She is married to a professional guide (which is work in itself), is raising their 4 children with help from him, and usually maintains two other jobs over the year. She has been living in and fishing/rowing the West Yellowstone area since 1987. Lanie has been guiding the Madison since 1997. She finally wised up after rowing John down the Madison for ten years without pay, and started guiding for a monetary return.